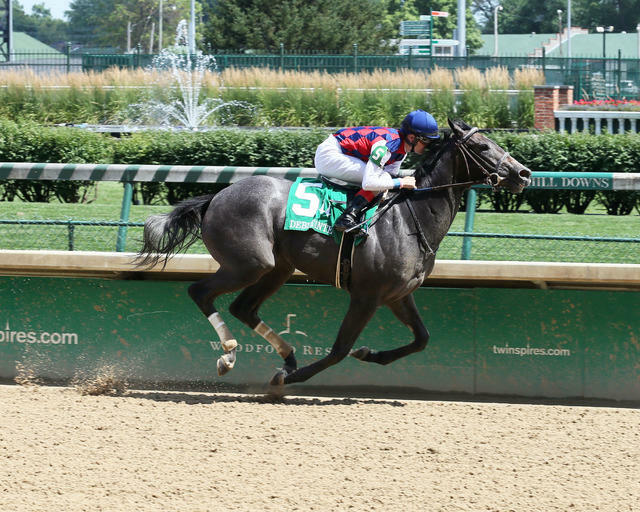 Three Chimneys Farm and Fern Circle Stables’ Breeders’ Cup Juvenile Fillies (Grade I) runner-up Restless Rider will challenge seven 2-year-old fillies that were entered for Saturday’s 75th running of the $200,000 Golden Rod (GII) at Churchill Downs. The 1 1/16-mile race is the co-headliner on the second-to-last of the 21-day Fall Meet. Billed as “Stars of Tomorrow II,” each of the 12 races is exclusively for 2-year-olds. The Golden Rod – a “Prep Season” race on the “Road to the Kentucky Oaks” in which the Top 4 finishers will receive 10-4-2-1 points, respectively – goes as Race 9 at 4:57 p.m. (all times Eastern). First post is 1 p.m. The co-featured $200,000 Kentucky Jockey (GII), which attracted 14 colts and geldings, is Race 11 at 5:56 p.m. Restless Rider, a gray daughter of Distorted Humor, finished 5 ½ lengths behind wire-to-wire winner Jaywalk in the Juvenile Fillies. Trained by Kenny McPeek, Restless Rider scored an ultra-impressive 11 ¼-length win in the Debutante Stakes in late June at Churchill Downs and a 2 ½-length score in the Alcibiades (GI) at Keeneland in October. Restless Rider will once again be ridden by Brian Hernandez Jr. and break from post position No. 5. Among Restless Rider’s rivals in the Golden Rod is gutsy allowance winner Champagne Anyone. Owned by Six Column Stables and Randy Bloch and trained by Ian Wilkes, Champagne Anyone rallied from nearly 10 lengths off of the early pace in a first-level allowance race at Keeneland to defeat six rivals. Champagne Anyone, a daughter of Street Sense, will break from post 4. Stablemate Princess Causeway, a half-length allowance winner at Keeneland also is entered in the Golden Rod and drew post 7 with Julien Leparoux aboard. Another noteworthy Golden Rod entrant is debut winner Break Curfew for trainer Chad Brown and Seth Klarman’s Klaravich Stables. The Into Mischief filly debuted Oct. 24 at Belmont Park and won easily by 3 ¾ lengths under jockey Javier Castellano. Break Curfew will break form post 8 with Castellano aboard. The field for Golden Rod from the rail out (with jockey and trainer): Gold Credit (John Velazquez, Ignacio Correas IV); High Regard (Corey Lanerie, Vicki Oliver); Reflect (Tyler Gaffalione, Keith Desormeaux); Champagne Anyone (Landeros, Wilkes); Restless Rider (Hernandez, McPeek); Liora (Channing Hill, Wayne Catalano); Princess Causeway (Leparoux, Wilkes); Break Curfew (Castellano, Brown). Monomoy Girl used last year’s runner-up finish in the Golden Rod to catapult her to victories in the Kentucky Oaks (GI) and Breeders’ Cup Distaff (GI).